In its more than 120-year history, the ANHBC has serviced communities as a hospital, orphanage, fresh-air camp, and, finally, as an association that builds stronger neighbourhoods through its network of neighbourhood houses. The story of how the Association of Neighbourhood Houses B.C. evolved to operate seven neighbourhood houses and an outdoor camp goes back almost as far as B.C.’s history as a Canadian province. 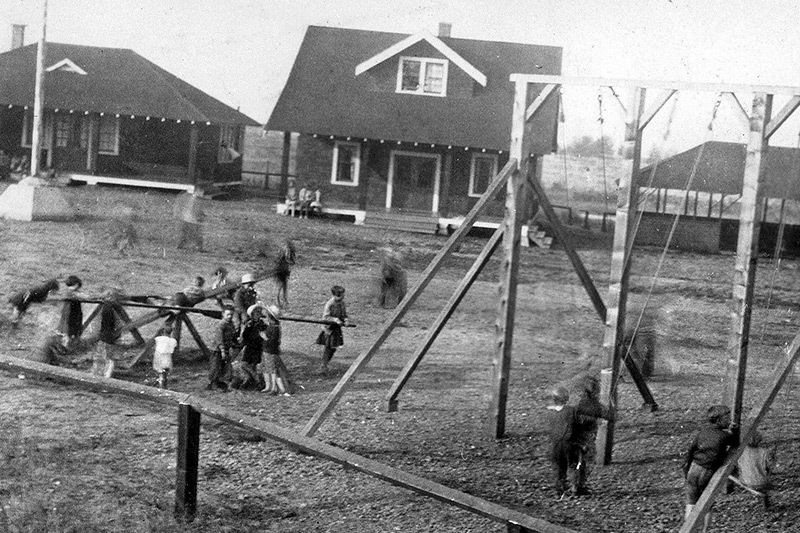 Since 1891, what’s known today as ANHBC has operated in Metro Vancouver as a hospital, an orphanage, and a fresh-air camp before focusing on community-based neighbourhood houses that welcome and offer programs and services to everyone, regardless of background. ANHBC is part of a neighbourhood and settlement house movement that began an ocean away in 19th century England. As rural residents migrated to cities in search of work and immigrants fled persecution in continental Europe, they left behind their families, communities and everything that was familiar to them. The neighbourhood and settlement house movement – starting with the establishment of Toynbee Hall in London in the mid-1880s – recognized a need for public recreation programs, day nurseries for working parents (the city’s first), English as a second language and adult literacy classes, and a new profession called social work. Today, neighbourhood houses are hubs for community development activities, programs and services that address and adapt to local needs; there are thousands of neighbourhood houses in more than 30 countries around the world. ANHBC initially began as Alexandra Neighbourhood House, a women’s and children’s hospital that opened its doors in 1891 in Vancouver’s Kitsilano neighbourhood at 7th Avenue and Pine Street. Three years later, the hospital was converted to an orphanage and officially incorporated as the Alexandra Community Activities Society. Alexandra Society was one of the first charitable societies in B.C., and ultimately became the ANHBC. 1891: Alexandra Neighbourhood House opens as a Vancouver women’s and children’s hospital. 1894: The hospital is converted to an orphanage, and the Alexandra Community Activities Society is officially incorporated as a charitable society, one of the first in B.C. 1938: Orphanages across Canada are being replaced by foster homes. The Alexandra Neighbourhood House orphanage is closed, and is officially established at 7th Ave. and Pine St. as B.C.’s first full-fledge neighbourhood house, welcoming all families and offering services ranging from daycare to seniors’ drop-in programs. 1942: The success of Alexandra House leads to the opening of Gordon Neighbourhood House in the West End, followed by Cedar Cottage Neighbourhood House in 1965. 1966: With three active neighbourhood houses in operation, Alexandra Society changes its name to the Neighbourhood Services Association. 1969 to 1971: Alexandra House is used as a youth hostel. Late 1960s and 1970s: Other sites to be incorporated into the Association included an outdoor camp (1968), later to become Sasamat Outdoor Centre; the new Alexandra Neighbourhood House in Crescent Beach (1973); Kitsilano Neighbourhood House (1974); South Vancouver Neighbourhood House (1976); and Mount Pleasant and Frog Hollow neighbourhood houses (1977). 1975: The original Alexandra House is destroyed in a fire. The property is sold and the proceeds used to establish the Alexandra Foundation for Neighbourhood Houses, which continues to be active today in supporting neighbourhood house projects and championing the start-up phase of new neighbourhood houses. Present: ANHBC now operates seven neighbourhood houses in Metro Vancouver and the Sasamat Outdoor Centre. It is also linked to a larger network of neighbourhood houses that include Burnaby Neighbourhood House, Collingwood Neighbourhood House, Downtown Eastside Neighbourhood House, Kiwassa Neighbourhood House, Little Mountain Neighbourhood House, North Shore Neighbourhood House, and Oak Avenue Neighbourhood Hub (these are separate legal entities but collaboration and partnerships are frequent occurrences). Discover how you can help us continue our work for decades to come in neighbourhoods throughout Metro Vancouver.